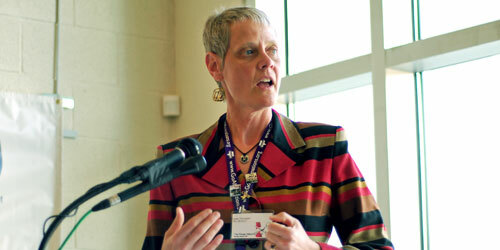 Affirmations Executive Director Leslie Thompson at the opening of the new community center building in 2007. BTL file photo. After nearly 11 years of running Michigan’s largest LGBT community center, Affirmations CEO Leslie Ann Thompson announced her resignation on Aug. 11, effective no later than Jan. 15, 2011. Thompson has not announced her future plans. Thompson is Affirmations’ longest standing CEO, and was hired in 2000 following previous executive directors Julie Enzer and current Between The Lines co-publisher Jan Stevenson. She also holds one of the longest job records of any LGBT center executive director in the country. During Thompson’s time at Affirmations, she pulled the center out from economic struggle and led the charge to build a new, state-of-the-art, environmentally friendly community center for the nonprofit. The Capital Campaign, under Thompson’s tutelage, raised over $5.3 million and included unprecedented contributions from the Big Three automotive companies in metro Detroit. Completion of the Capital Campaign fundraising effort also included the launch of Affirmations’ Civic Engagement and Social & Recreation programs, which have included efforts to get LGBT community members involved in political elections, as well as provided the community with unique gay-friendly social options, including knitting groups, fitness classes, film groups and game nights. With Thompson at the helm, Affirmations celebrated the opening of its new 17,000-square-foot home in 2007 on Nine Mile Road in the heart of downtown Ferndale. It is LEED certified and includs a fully stocked cafe, 15 public-access computers with free wireless internet, an art gallery, libary and rooftop sky deck – perfect for taking in the sights of Motor City Pride every June on the street below. Since the opening, Thompson has worked with her team to maintain programming and services at the center for all age levels, interests and needs – all during the toughest economic downturn the center had ever experienced in its over 20-year history. The Board of Directors, led by current President Mary Rose MacMillan, notified members that it will be hiring an interim executive director in the coming months, as well as beginning the search for a permanent replacement for Thompson. Plans for a farewell reception for Thompson are in the works. Comments and well-wishes for Thompson are encouraged on the center’s Facebook page at http://www.facebook.com/goaffirmations. Watch for updates on the center’s new direction and executive director search in future issues of Between The Lines.